THIS COMPETITION HAS NOW CLOSED. THE WINNER HAS BEEN ANNOUNCED HERE. This week we’ve got this wonderful Audrey Hepburn-style jewellery set to give away. Isn’t it fabulous? Our beautiful collections are inspired by influential eras and iconic designs. From the elegance of Art Deco to the derring-do of WWII, the colourful retro style of the 50s to the glamour of the silver screen. We know that variety is key when buying gifts for friends and family, so we have an abundance of glorious things to tempt you. From retro homeware and vintage style jewellery to outdoor dining accessories and adorable traditional toys, you’ll find them all at PastTimes.com. 1950s Glamour Necklace: Imitate the style icons of the 1950s with our vintage Hollywood inspired pearl and cut crystal choker. Five strands of glass pearls support a glorious floral centerpiece sparkling with tiny cut glass crystals. This choker exudes glamour and will definitely make you stand out from the crowd. Crystal Earrings with Pearl Drop: Stunning 1950’s style pearl and Czech Crystal drop earrings. 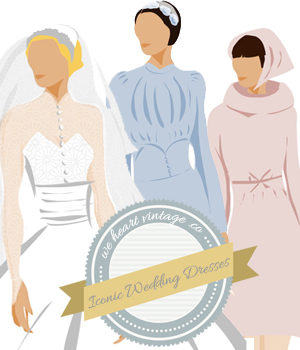 Inspired by the bridal outfit of Margaret Sterling in Mad Men series 3. These gorgeous earrings are perfect for those looking for a sophisticated timeless pair of earrings. For your chance to win this beautiful jewellery, simply take a look on the Past Times website, pick your favourite thing and let us know what it is in the comment box below. Entries open on Friday 15th February 2013 and close at midnight GMT on Thursday 14th March 2013. We will contact the winner shortly afterwards and pass their details onto Past Times who will send out the prize directly. Past Times have ALSO kindly offered We Heart Vintage readers a discount code for 15% off plus FREE DELIVERY when you spend over £15. The discount code is WHV15 and can be used across all products including sale items. See the Past Times website for full T&C’s. Code expires on 28th February 2013. I simply love the Sterling Silver Crystal Flower Locket. I love that Grey Molino scarf – it is exactly what my daughter would love. I love the 5-Drawer Mirrored Glass Jewellery Armoire! It is so beautiful in a timeless way. So many favorites, this is definitely one of them! My favourite is the Birdcage Lantern, I’m going for a shabby chic theme in my bedroom so it would match quite well. I liked the 5 drawered mirrored jewellery box. I like the 1950’s glamour necklace. And the 1950’s earrings that Audrey Hepburn wore. Its soooooo hard to choose just one thing – love this website – ive narrowed it down to the above though!! OMG! First I have to tell you, I ALWAYS wanted this necklace so badly!! I never found a shop who selled it until now! Thank you so much for the opportunity to win it, this is so great! I do love the everything stops for tea picture. I have a bit of a British theme in my hallway, I guess half spurred on by all things jublympics last year. Lovely site. what a lovely website! so many precious things. having to chose, my favorites would be the art deco pieces, especially the tassel earrings. I adore the “Where there is tea, there is hope” footstool with the British flag on it. So wonderfully English! My favourite has to be themSet of 2 Globe Bookends. the retro table top phone brings back memories, even though it looks like a museum piece and really ages me! I love the Art Deco Sterling Silver & Black Agate Lozenge Earrings. I love the Gargoyle Garden Statue. retro table topped phone! wow love it! My inner Holly GoLightly is all a-shiver! I’ve never entered a giveaway but this one is too good. It has to be from the soft toy section, Uncle Bulgaria from the Wombles. My Grandparents bought some Wombles marrionette puppets for me, my sister and our cousins when we were children. Reminds me so much of our past times. I can’t choose a favourite piece of jewellery. They’re all so beautiful and timeless. On top of the items offered as a prize I really love the Crystal Art Deco Drop Earrings. I really love these items, I was able to buy a tooth keepsake, but I never found a curl one, I love these and will buy for my next grandchild. They are great value. I love the ceramic bird bath. I just love my garden and this would look great – I always feed the birds in my garden and love watching them feeding . I like butterflys so the sterling silver and marcasite ring. I love the Daisy Flower Necklace with Swarovski Crystal. You gotta have a bit of sparkle! Love love love the 1950s Glamour necklace. Very Liz Taylor. I was charmed with a brooche shaped into school badge with the “Perfect” subtitle. Not because it is pretty or I’d like to have it. It reminded my my childhood days in Polish school, where the best students were rewarded with red badges with white trimming and “Top Student” title. Back in the 90s I had quite a collection of these. Simply love the Art Deco peacock feather earrings! The Where There is Tea There is Hope cushion because a cup of tea always seems to help!! My favorite thing is the Crystal Art Deco Necklace! Love the daisy tea light holder. I love the Steiff Lamby Lamb and would love to give this to my daughter when she is born (in June). I love this spotty cockerel http://www.pasttimes.com/gift_finder/by_occasion/easter_gifts/red_spotty_cockerel_doorstop-871004.htm because he is simply fabulous and functional. So much stuff I like! This is cute: http://www.pasttimes.com/home/lighting_mirrors/lovebird_house_tea_light_holder-869337.htm would be nice hanging on balconies! I really like the Cream Butterfly Photograph Holder – it’s gorgeous and I think I might just buy it! http://www.pasttimes.com/gift_finder/by_recipient/gifts_for_her/sterling_silver_marcasite_fan_ring_-_size_u-837434.htm – so loving this ring – so beautifully unique and different. Love the Crystal Flower Bracelet. I love the Sterling Silver & Marcasite Flower Stud Earrings – beautiful! Definitely the Lula Marcasite and Pearl Drop Necklace! So pretty! I love the Downton Abbey cushion! The Audrey Hepburn set is just beautiful, classic and from an era when women were so feminine and glamorous……it’s perfect! I love the marmite pot. u either love it or u hate it, I love it. Trovo bellissimo il Windsor Travel Writing Set: è incredibilmente vintage (come piace a me), un bellissimo oggetto d’arredamento e allo stesso tempo un oggetto utile, che sicuramente utilizzerei! Decisamente il mio articolo preferito! I think Windsor Travel Writing Set is very beautiful: it is incredibly vintage (as I like), a beautiful decorative object and at the same time a useful object, which surely I would use! I love this> http://www.pasttimes.com/gift_finder/by_recipient/gifts_for_her/sterling_silver_cubic_zirconia_necklace_earrings-816840.htm its simply stunning for a modern elegant touch suitable for day or evening wear. I love this 1950’s Art Deco product which is the prize. I love their shops! there used to me one just near me and it was heaven! I love the cream cornice wall mirror. lovely.